In an announcement that is well-timed with the conclusion of bilateral talks between the U.S. and China, Beijing declared that it would drastically cut the number of executions. But China accounted for the vast majority of worldwide executions in 2008, having executed far more criminals than the rest of the world combined. Approximately 5,727 executions were carried out worldwide in 2008, down from 5,851 the year before. China carried out the death penalty over 5,000 times last year, according to a report by Italian human rights group Hands Off Cain. This figure is an estimate put together based on media and human rights group reports, since the actual total is a state secret. Amnesty International reported a much lower estimate of 1,718 executions. The truth is, nobody really knows how many people are executed every year in China. We have classified documents that state that as many as 24,000 people were killed in an eleven month period between 1983 and 1984 during the government’s ‘strike hard’ campaign. But the number could be as high as 8,000 a year now. Use of the death penalty in China has dropped dramatically since 2001, when China began readying for the Beijing Olympics. As it is impossible for the country to abolish capital punishment under current realities and social security conditions, it is an important effort to strictly control the application of the penalty by judicial organs. 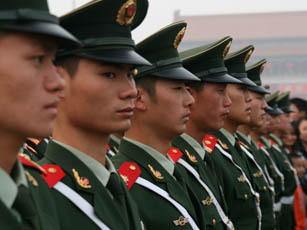 In 2008, the Chinese courts sentenced 159,020 people either to death, life imprisonment, or more than five years in prison. Currently, China uses the death penalty for 60 different offenses, including tax evasion and drug trafficking. Just days ago, in an unprecedented move, Sichuan province put to death a company executive who had killed four people while drunk driving. The government is expected to announce soon how many citizens will be executed for their participation in the recent riots in the northwestern Xinjiang province. Since 2006, many of China’s executions are carried out in 40 “mobile execution units,” vans manufactured by a Chonqing-based company in which lethal injection is locally administered. This saves the government from sending death penalty criminals to Beijing, which costs around $250. But about half of Chinese executions reportedly are still by firing squad. Of the 45 other countries that still use the death penalty, Iran and Saudi Arabia had the highest per capita death penalty rates in 2008, with 346 and 102 executions, respectively. Also, Amnesty International reports that the Iranians and Saudis still use stoning and beheading, respectively, as means of capital punishment. Both nations continue to execute minors. The United States executed 37 people last year, continuing a downward trend that began in 1999, when 98 people were put to death. According to Amnesty International, Japan carried out 15 executions last year, the highest number since 1975. Indeed, the U.S. executed 37 people in 2008, a number which indicates a steady decline in the use of the death penalty over the past decade. Half of the executions last year were in Texas. Like the U.S., China is also in a position to improve its international image by cutting back on capital punishment. We also execute people – don’t we? Since China’s population is so large, how does this death sentence/5-year imprisonment/life in prison rate compare to the US?